The last ever pitched battle to be fought on British soil took place on 16th April 1746 on Drummossie Moor, overlooking Inverness. 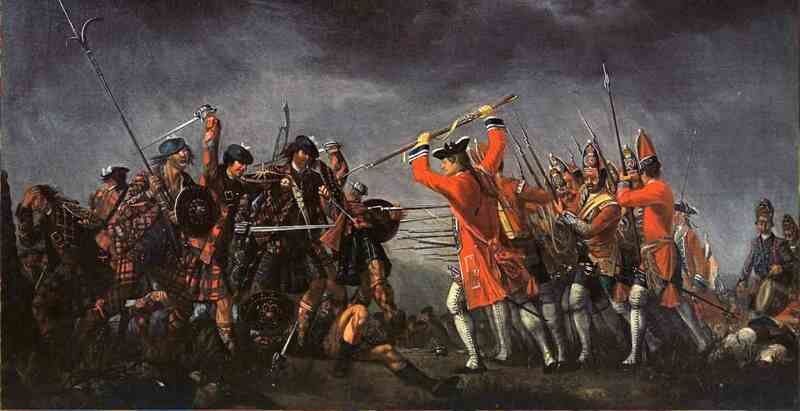 At the Battle of Culloden, a well-supplied Hanovarian Government army led by the Duke of Cumberland, son of King George II, would face the forces of Charles Edward Stewart, The Young Pretender, in the final confrontation of the 1745 Jacobite Rising. The Jacobite Rising was an attempt to overthrow the House of Hanover and restore the House of Stuart to the British throne. Having failed in their attempt to gain support in England and advance on London, the Jacobites had retreated all the way back to Scotland. Under constant pressure from the King’s army, Charles marched his force of around 6,000 men ever further northward, before finally establishing a base at Inverness. Ignoring advice to launch a guerrilla campaign, Charles chose to stage a defensive action and confront his enemy at nearby Drummossie Moor. He also ignored warnings that the marshy rough ground may favour the larger Government forces. And so, on a rain soaked morning the Government army struck camp and headed towards the moorland around Culloden and Drummossie to take up their positions. Over the first half-hour of the battle, Cumberland’s artillery battered the Jacobite lines, first with roundshot and then grapeshot. Finally, Charles issued the orders his Highlanders had been waiting for, to charge the enemy. Although hampered and slowed down by the boggy ground, many of the Highlanders reached the Government lines. In the bloody hand to hand fighting that followed, the new Redcoat tactic of bayoneting the exposed side of the man to the right, rather than confronting the one directly in front appears to have paid dividends. The Highlanders finally broke and fled, the entire battle had lasted less than hour. Over the weeks that followed, those Jacobites that managed to escape the battlefield were hunted down and killed (as pictured below). Charles himself evaded capture for five long months, eventually making good his escape to France and final exile.